Niyati Dubey, our wonderful and well-traveled contributor is back and this time it is a place she has called home for quite some time- Nairobi! And with the humongous information we got from her on Nairobi, we decided to do an entire series dedicated to this vibrant city. This article is now available as a tour on GPSmyCity app. Download Now! The capital city of amazing Kenya, Nairobi is usually on the bucket list of most of the travelers. It is amongst Africa’s most dynamic and interesting cities. It is the financial center of East Africa. For those who call it home, Nairobi is a jewel worth marveling at, the city's cosmopolitan charms include a vibrant cultural life, fabulous places to eat, exciting and vivacious nightlife and absolutely great weather all around the year. It is a city that never seems to sleep and has boundless energy. The buzzing capital city of Kenya--Nairobi dazzles visitors with its beautiful and natural wildlife habitats, stunning attractions and amazing things to do. Nairobi has a cosmopolitan culture with a diverse population of immigrants and expats coming from various cultures and countries around the world. There are various churches, temples, mosques and Gurudwaras within the city precincts. Nairobi is home to museums, historic sites and monuments plus many spectacular hotels to cater for safari-bound tourists and five-star luxury. The word Nairobi comes from the Masai language which when translated into English means “the city in the sun”. This city is also known to be the gateway to East Africa and has the honor of being the only city in the world that has a national park inside its walls. So it was but natural for us to cover the wonderful wildlife and national parks of Nairobi in the first edition of the Nairobi Series. Our Friends in the Wild! 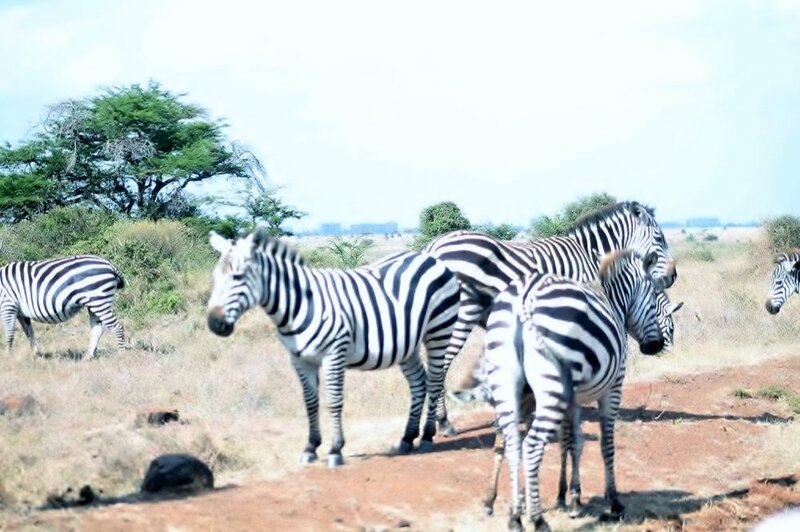 Nairobi National Park offers wildlife experience to both locals and visitors. It is Kenya's oldest and most famous national park covering 117sq km (72.7 sq miles) and has stretches of bushy countryside, deep rocky valleys and gorges with long grass. The park is a place where you can get an opportunity to see animals in their natural African surroundings. It's the only national park on earth that borders a capital city. The wild life is separated by an electric fence from the city. Driving time to and fro takes only half a day to explore this park. This park is the only natural safari park that has a cityscape in the background that can be seen from almost any part of the park. Enjoy the scenery, the wildlife as well as the unforgettable backdrop of the city’s skyscrapers. It is a scene you will not get anywhere else on the planet. The park boasts of diverse wildlife population which includes African Buffaloes, water bucks, gazelles, rhinos, lions, giraffes, zebras, cheetahs, leopards etc. This park also has rich diverse population of bird species. One can camp within the park boundaries; Stay in the luxurious and intimate Nairobi Tented Camp- the first and the only tented camp inside the Nairobi National park. This camp has spacious, furnished tents, an on-site restaurant and a lounge tent. Outside the park, The Emakoko boutique lodge with 10 rooms hosts guests in lavish cottages set in a serene spot on the rim of a valley. The Nairobi Animal Orphanage is a refuge and rehabilitation center for wild animals, found injured or abandoned in Kenya and was established in 1964. It serves as a valuable education center for visitors and school children. They can walk around and see wildlife up close and personal. People who might otherwise not have the chance to interact with a variety of wild animals like lions, crocodile, cheetah, leopards, wild cats and wild dogs, can get that chance here. Group of monkeys and baboons can be seen roaming freely here too. The Elephant Orphanage gives the opportunity to have an uninhibited and close view of the majestic giants – Elephants. It gives us an insight on how devastating poaching is and how badly it affects the elephants at an emotional and psychological level. Elephant calves either orphaned by poachers or natural occurrences are brought here from all over the country. They are given extremely specialized treatment and cared for by a highly dedicated staff. It is their second chance at life. The orphanage is open to public daily strictly for 1 hour from 11.00am-12 noon during the feeding times of the calves who are fed with monster baby bottles and they walk around in front of public. Vital information on how these rescued baby and teenage elephants are brought to the orphanage can be learned here. There are unique and moving stories, on raising them, how they got their names and the efforts being made to re-introduce them back in the wilderness, through an interactive session. There is a blind rhino in the orphanage too and few warthogs wander around the area where the calves were being fed. There is also an option for visitors to choose to adopt an elephant where they will be in charge of the elephants care at the orphanage. A couple of months back we did an interview with the founder of this wonderful effort- Dr. Daphny, it was our most touching till date! At Nairobi Giraffe Centre, the highly endangered Rothschild’s Giraffe is protected. Now the difference between a common and Rothschild’s Giraffe is that there is no patterning below knees. You can observe these wonderful and friendly animals from really close proximity. Information about Giraffe is provided at the center and an elevated feeding platform is installed to give visitors a chance to experience hand feed the Giraffes. Why you can even go a little further and touch or even kiss them!! 'Mamba' means Crocodile in Swahili. As the name suggests, this is a crocodile sanctuary, home to Nile crocodiles. One gets an opportunity to see real crocodiles sunbathing and feeding. It also includes a restaurant, opportunities for relaxing in gardens and boating .It’s a great place to escape the city and enjoy Nairobi’s beautiful green scenery and fresh air all with some great company of crocodiles! View the deadly ‘Black Mamba’ and puff adders up close. There is also an assortment of other dangerous as well as harmless reptiles like lizards, crocodiles, turtles and fish at the Nairobi Snake Park. Being situated at the National Museum grounds, you can also enjoy the serene environment and dining facilities on offer. Sturdy cycles are available for hire for visitors to use on designate forest trails. Weather: Nairobi climate is known to be the best weather, it has two rainy seasons: Mar-May and Oct-Nov. Dry months are Jan-Feb and June-Sept ( best season to visit a national park). Max temp is around 27 all year round and minimum never goes lower than 10. Getting there: It's easy to get to Nairobi with plenty of airlines like Emirates, Turkish Airlines and Kenya Airways traveling there daily and it’s also the main starting off point for most of the safari tours in Kenya. VISA: Visa is easily obtained at the airport upon arrival with a fee of 50 US dollars. A single entry visa is valid for three months from the date of issue. Going around Nairobi one can do through cabs. Uber and other cab companies operate here like mondo rides and little cab at affordable prices and traveling in any of them are quite safe. Accomodation: Accommodation in Nairobi is an experience of luxury and comfort, with an extensive variety available. Follwing are some of the options that we have selected for you. Nairobi has lots of options to suit every budget. To look at all the options, simply type Nairobi in the nice little search box above. For a more comprehensive choice, you can head straight to our Hotel Search page. Older PostThe Ultimate Luxury Experience On Colossal Yang!